Etisalat Digital and Ericsson will jointly showcase smart traffic management solutions at GITEX Technology Week 2018. Under the GITEX theme: Experience Future Urbanism, the two Digital giants will demonstrate IoT Accelerator capabilities, as well as locally develop and promote use cases for the UAE transportation sector. The demonstrations include Secure Vehicle Tracking, Automotive Surveillance and eCall Accident Simulation Alert, which notifies authorities, emergency services, insurance providers, the Roads and Transport Authority, and other vital stakeholders of the occurrence of an accident. Additionally, Etisalat Digital and Ericsson will showcase the latest smart parking and smart traffic light control solutions. The solution is built using Ericsson and Etisalat IoT platforms, and provides an integrated approach to traffic management optimization, paving the way towards a true smart and sustainable city. The solution automates the transport ecosystem of roads, vehicles, drivers and traffic management authorities. By uniting technology and markets, cities can solve traffic issues. Alberto Araque, Vice President/Internet of Things & Digital Payments says: "The showcase of our platform with Ericsson, is a testament to the efforts and focus on our strategy ‘Driving the Digital Future to empower societies. We are also thankful to the vision and leadership of UAE for inspiring to deliver world class networks and innovative services for the smart city future. 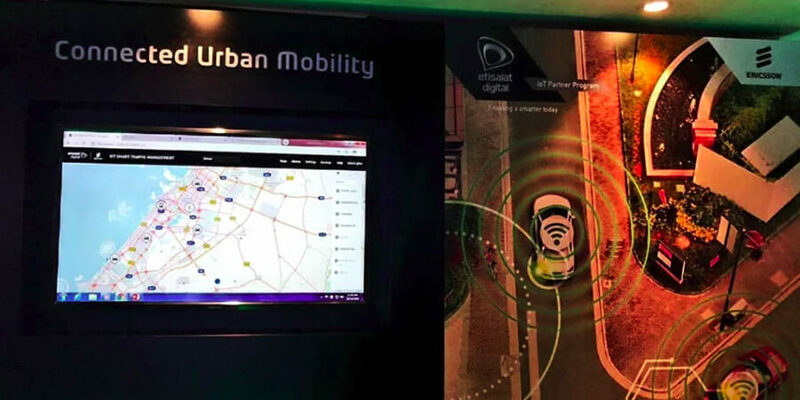 We are pleased to partner with Ericsson, global leaders in the 5G and IoT domain, and to demonstrate use cases that have the potential to transform the transportation experience in the UAE as we know it." Alp Uysal, Head of Strategy, Technology and Sustainability, at Ericsson Middle East and Africa says: "Making data actionable is the key to a successful smart city. Ericsson Transport solutions jointly developed with Etisalat will enable the city to manage growing traffic and increase driver safety more efficiently and at lower cost. This is a ready-made IoT solution that Etisalat Digital can offer to cities and governments today." Using Ericsson's and Etisalat Digital's IoT capabilities and Mobility Solutions, this unified IoT Platform offers advanced traffic management through intuitive and easy-to-use interfaces. All software is configured and updated remotely from the Etisalat Digital cloud, meaning software updates are done without any interruptions in operational processes, and without significant changes in staffing requirements.